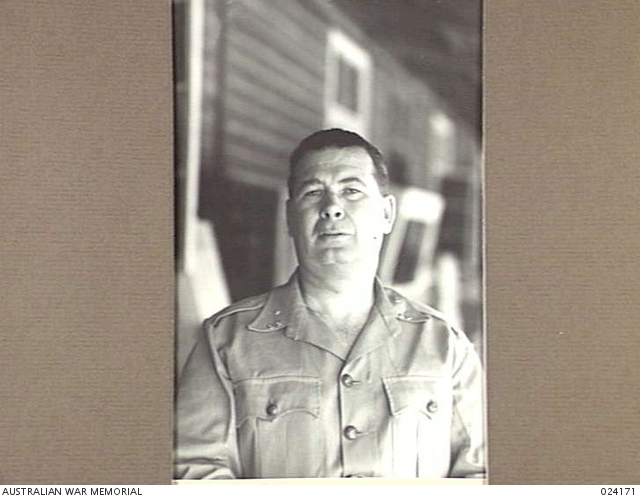 William Ballantyre Simpson served to both WWI and WWII. His service numbers are 177266 and NX34744. Cairo, Egypt. 1941-08. 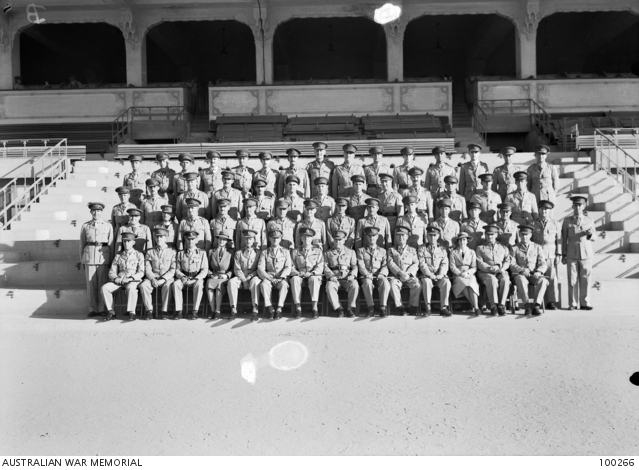 Group portrait of Officers of HQ AIF Middle East. Left to right: Back row: Captain (Capt) E. H. Wilson; SX7174 Capt Ivor Henry Thomas Hele; TX2048 Capt E. W. Seldon; Lieutenant (Lt) D. W. C. Moore; NX11810 Capt C. Cheong; VX3049 Capt D. J. Jackson; NX12283 Capt F. M. Paton; TX2076 Major L. M. Newton; VX11459 Major W. L. Larkin; WX1506 Capt J. W. Elliott; VX15174 Lt E. D. O’Rourke; NX7443 Lt H. P. Braddock; VX7618 Lt B. C. Meredith; TX981 Lt H. M. Thomson; Mr H. Maddern, (Red Cross representative). Second row: VX40944 Lt K. Black; NX13548 Lt Lyndon R. Dadswell; VX23299 Capt A. H. Stanton; NX12425 Capt I. R. Duffy; VX176 Capt G. Nicholls; VX20926 Major S. Johnson; NX465 Major A. G. M. Burns; NX70834 Major H. J. Eastman; VX12841 Major F. J. Howard; VX18253 Capt J. H. Nicholls; VX124 Major S. J. Greville; Capt J. F. McCulloch; Capt Rogers. Third row: Capt N. D. Carlyon; QX6266 Lieutenant Colonel (Lt Col) T. P. Fry; Chaplain T. McCarthy; VX19244 Lt Col F. R. Burton; VX5 Major K. S. McIntosh; NX12314 Lt Col Watchorn; NX5 Lt Col P. A. Parsons; VX39804 Lt Col J. L. Treloar; VX306 Lt Col W. J. Balchin; WX3330 Lt Col A. L. Dawkins; WX1526 Major M. H. Trethowan; NX70827 Major R. Chambers; SX1453 Major R. Harvey; Lt Col A. G. Torr; VX316 Major J. R. Liston; NX201 Major H. E. Gale. Front row: VX12722 Lt Col E. M. Dollery; VX12703 Lt Col R. Kendall; VX38741 Col J. E. Down; VX361 Matron A. Sage; NX2 Col R. H. Irving; SX1470 Brigadier C. E. Prior; VX2 Major General S. R. Burston; VX1 General Sir Thomas Blamey; VX12396 Brigadier L. E. Beavis; NX34744 Brigadier W. B. Simpson; VX20304 Col J. K. Adey; VX20381 Sister J. E. Headbury; VX17971 Lt Col L. G. Binns, and VX247 Lt Col C. A. Stinson.